Oh wow, how is it July 26th already? That Steve Miller lyric–‘”time keeps on slippin’ slippin’ into the future”–is ringing so very true and scary. My moments are flying by, without pausing to take it all in. Sigh. 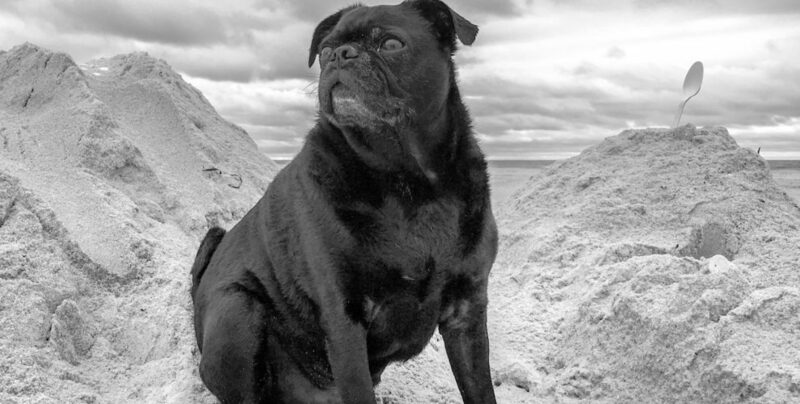 I was just on the beach with Rocky the Pug, the sun was beaming, he was canoodling with a brown and white cocker spaniel and I was in bliss. I had no sense of time and space, just the moment. Being with him. Watching the ocean. Feet squishing in the sand. Teeth unbrushed. It was nice. Really nice. I hope you have a second for a moment for yourself. It’s a sweet gift to yourself. And you ought to have something that’s just yours, if only briefly, every day. Long distance relationships make…well, lots to be said on that! I don’t need a human rights court telling me I can be horny in my 50’s, I know that already, but I don’t mind the rest of the world knowing that about women in their 50′s, so cool cool. Great music made by talented women as anointed by NPR. Family leave, from a man’s perspective. Dry shampoo. I’m still intimidated by it. And now have a laugh with Annie Lederman.